The Wild Outsiders visit Arizona every year, as Teton's parents, Grey Wolf and Timber, winter in the state. Each time we go, we try to travel to a new region for a short trip. This time, it was a visit to the Havasupai Indian Reservation. The Havasupai people have lived in the Grand Canyon for 800 years and after much history of defeat, have looked to tourism as their main source of income. Havasupai means 'people of the blue-green water' and that is an accurate portrayal of what the residents of the Supai Village see each day and the reason why there are thousands of tourists each year. We spent the night at a small, run-down motel in a nearby town and then headed to our destination, just outside the Grand Canyon National Park. After entering the reservation, we arrived at Hualapai Hilltop. There are no services once you arrive at the Hilltop. The nearest place to fuel up and for food and water is in Peach Springs, a 66 mile trek from the trail's starting point. This was a rather crowded parking lot full of tourists gearing up for their journey, and also local workers, recharging their mules and horses for the trek back down into the canyon. As Supai Village is not accessible by car, the short list of ways to get there include walking, flying in on helicopter, or riding a horse. Enjoy the views here by looking down upon miles and miles of canyon. The trailhead at the top of Hualapai Hilltop. Our home base for the next few nights, Supai Village, is a 8 mile hike down into the canyon. There is no drinking water available for this 4-7 hour trek, so be sure to get plenty of water in Peach Springs! Depending on the time of year, it could be pretty warm without shade cover. During our trip in April, we were actually chilly and wore plenty of layers to start. 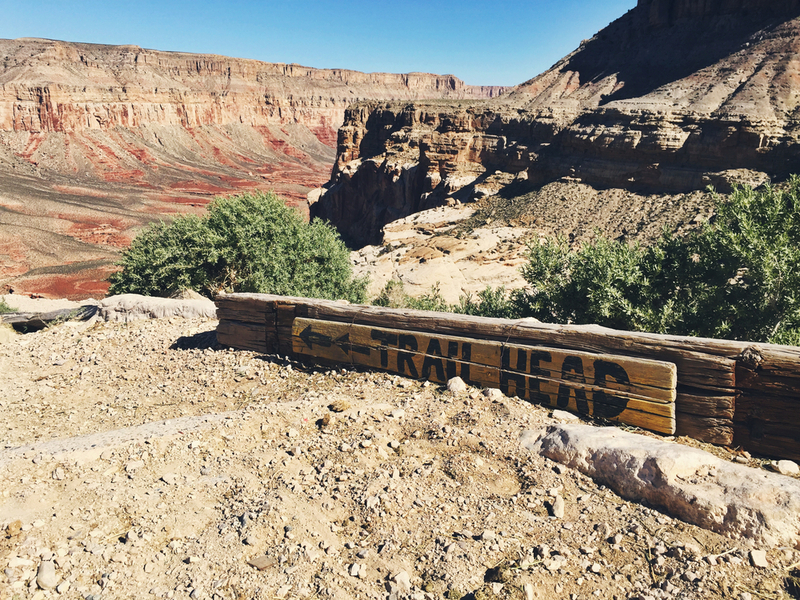 It is a beautiful journey down to Havasupai, walking across the sand through gorgeous canyons. It can get rather windy so beware of blowing sand. Also be sure to wear sunscreen! Although we had a rather cool day, the sun cover is few and far between, so the Arizona sun was beating down on us all day long. It is also important to be aware of the animals running along the trail. It is apparent when they are coming, as the stampede can be heard before they are seen. Move over to the side as the horses don't seem to care for courtesy and some ledges have steep cliffside drops. Moose and Teton descending down the canyon. A team of horses and mules carry gear and food to and from the village. Getting closer to the village! When you reach the beautiful blue river, there's only 1.5 miles to go. You'll start to notice the residential areas appearing. A grocery store, houses, farms, and even a school are seen before arriving at the tourist office. We had our hearts set on camping right near Havasu Falls at the campground, but reservations must be made many months in advance. A reservation must be made before descending into the canyon as only a small number of tourists are allowed in each night. Luckily, there was room at the Supai Lodge which had minimal amenities but suited our needs just fine. After checking in and pouring the sand out of our shoes, we explored the small village. With only one small diner, there is not much to do, so prepare to entertain yourselves. Many tourists chose to bring their own cook stoves and food as the diner has a small and quite processed menu. Their foods are flown in by helicopter and they do minimal growing of their own fruits and vegetables, so if there are dietary restrictions in your party, it would behoove you to bring your own supplies. After a good nights sleep and breakfast at the cafe, we headed a leisurely 1.5 miles to the first big attraction, Havasu Falls. Before reaching these falls, New Navajo Falls gives a small taste of what's to come. You'll also visit the campground which had a fried dough stand, waiting for hungry tourists to arrive. While the 1.5 miles is quick and easy, there are plenty of places to stop and take pictures of scenery, so make sure to allot enough time! Moose and New Navajo Falls. Havasu Falls is a blue-green triumphant beauty. The brown rocks give great contrast to bring out the water's colors that are first spotted from above, and then another great view after hiking down over 100 feet to the base. We could imagine many tourists swimming and playing in these clear waters during hotter times, but the weather had many just looking at the water instead of immersing themselves in it. Teton was a little parched from the desert hike! Another half mile walk leads the way to Mooney Falls, the star of the show. Viewing the beast from atop is as far as some choose to get. The climb down to Mooney Falls is not for the weak stomach. It requires a 190 feet steep climb down the cliff through tunnels, ladders, metal chains and handles that are often wet and slippery from the winds blowing the waterfall. Use caution descending this cliff! Moose on the top of Mooney Falls. Teton stands at the base of the 200 ft. behemoth. So much joy pictured here. We turned around and went back up to the falls, however some with more time may continue on 3 more miles to Beaver Falls, another set of beautiful waterfalls with many opportunities for cliff jumping. On our way back to the lodge, the weather warmed up so we decided to make a stop off at Havasu Falls once more for a dip. The cold water was refreshing and fun to play in! 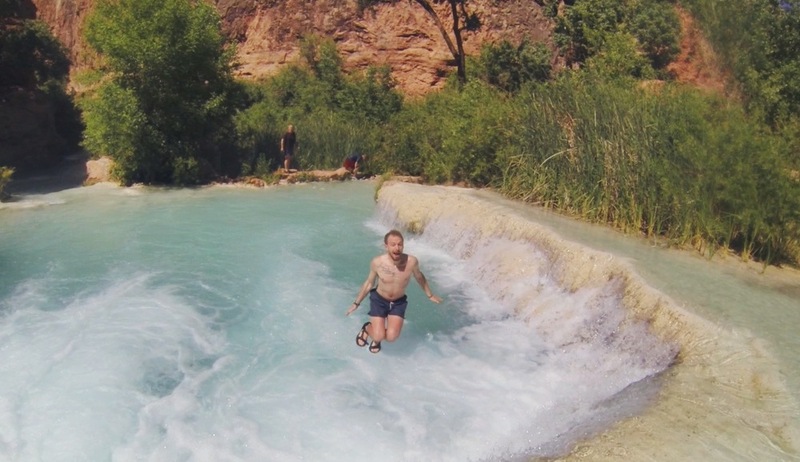 Swimming in the crystal blue waters of Havasu Falls. The climb back up the canyon was a little more difficult than the reverse, as to be expected, but worth it! Havasupai was definitely an amazing experience filled with cultural enrichment as well as beautiful scenery… a must see when visiting Arizona! We can't wait to make it back some day to camp at Havasu Falls to spend a full day enjoying the blue-green water pouring over us. Open sky at the top of the canyon, Hualapai Hilltop. After Havasupai, we drove back to Southern Arizona where Teton's parents live. About 45 minutes from their place resides Picacho Peak State Park. Picacho Peak is a super recognizable peak that stands as a lone massif on the desert plain. The Sunset Vista Trail which runs the peaks length before ascending to the top is one of The Wild Outsiders favorite day hikes, and one that they have tackled twice. The trail itself offers everything you would expect from a desert hike, high heat, dry plains, and tons of cactus to navigate. The awesome part about Picacho Peak is the climb up, which is largely exposed and takes a lot of help from cables and other implemented structures to climb. Much of the upper regions of the Sunset Vista Trail look like this. If you are afraid of heights, being dangerously close to cliff edges, or climbing semi-vertical rock faces then this day hike is not for you. If all of that piqued your interest then we would highly recommend that you look into this short 3-4 hour trip. Moose checks out the trail from above. If you make it to the top, you can expect to witness an amazing 360° view of the desert basin that is well worth the effort. We snuck the GoPro™ next to a burrowing owls burrow and caught the little guy in action! Scorpion hunting with UV lights!